Last night I attendied my first Good Friday service after having gone to the Holy Land with you. I was moved beyond words. 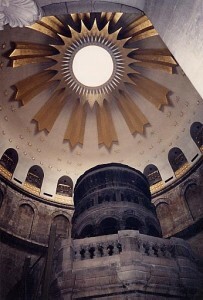 As Jesus walked to Golgotha in The Passion, mentally I was tracing the steps to and in the Church of the Holy Sepulchre. I pictured what it looked like then and now. I pictured where Mary stood. I felt the rock again in my mind. I smelled the wood of my Rosary and remembered the places we went. I remembered the darkness of most of that church but also the bright light above the tomb. Last week as they read the Passion at Mass, my fiancee leaned over to me and said “You were there”. What she didn’t know was that for those few moments, I was back there again. I’ve got to take her there some day. Yesterday as I drove home I saw some ponds and the waves from the wind and I thought back to the Sea of Galilee, then later I pictured Capernaum. I can’t tell you how much that trip meant. I don’t want it to be a once in a lifetime event. I want to go back. Thank you both for being our guides, spiritual and otherwise. Christmas was wonderful and I’m sure Easter will be too. In an extraordinary display of media bias, the Associated Press has reported that “the abuse cases of two priests in Arizona have cast further doubt on the Catholic church’s insistence that Pope Benedict XVI played no role in shielding pedophiles before he became pope.” . . .
Cardinal Angelo Sodano, dean of the College of Cardinals, delivered a remarkable defense of Pope Benedict towards the beginning of Easter Sunday Mass in St. Peter’s Square. . . .
Cardinal George again defends Pope BenedictCardinal Francis George of Chicago, president of the United States Conference of Catholic Bishops, has again defended Pope Benedict’s leadership in dealing with the clerical abuse crisis. “It was Pope Benedict who gave us, in different ways, the ability to handle this crisis more quickly and in a way that helps to heal,” for he “enabled us to keep the predators out of the priesthood permanently in ways that were not possible before,” Cardinal George said in an April 1 radio interview. Bishop defends Vatican’s handling of Tucson abuse casesBishop Gerald Kicanas of Tucson, the vice president of the United States Conference of Catholic Bishops, has defended the Vatican’s handling of the cases of Fathers Michael Teta and Robert Trupia, two suspended priests whom former Bishop Manuel Moreno was seeking to laicize. Both were laicized in 2004 after long delays; the former had been suspended in 1990, the latter in 1992. Colleen Carroll Campbell argues in an April 1 St. Louis Post-Dispatch column that the laity’s confidence in the Church will not be restored until they know that Church leaders share their righteous anger at abuse.